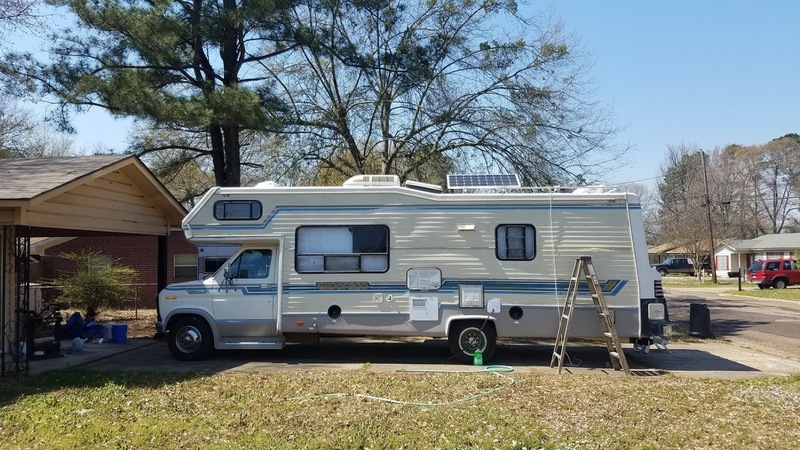 My adventures living out of a 1985 El Dorado Class C with my pittie mix, Lucy. 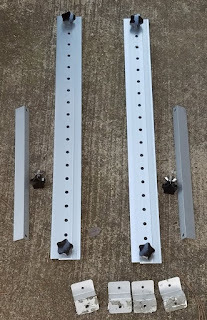 This is how I decided to mount the Renogy tilting solar panel brackets I bought. 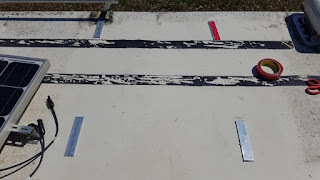 I lined them up with the solar panel with the brackets, drew lines around them with a marker, then put 3M VHB tape on them and applied them to the roof. 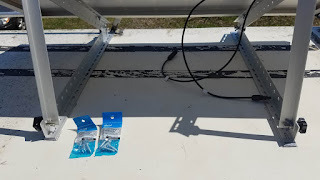 After the strips were stuck on, I lined up the solar panel brackets and drilled holes for the screws. 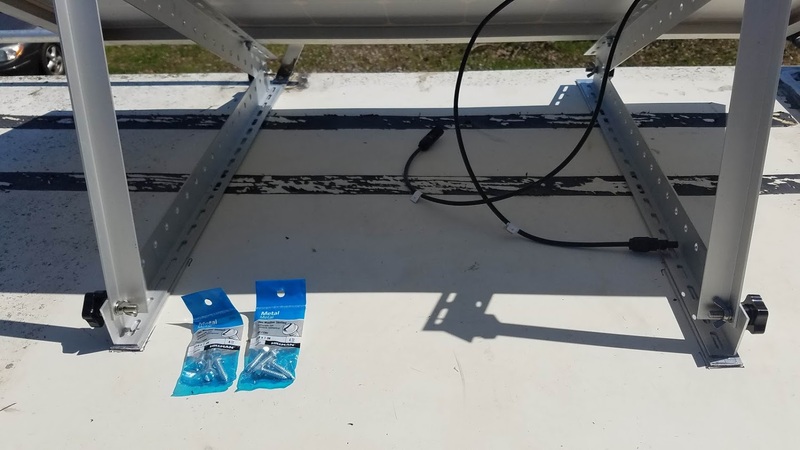 Then I went back and sealed around the bars with Dicor, screwed down the brackets and sealed over the screws with Dicor too. 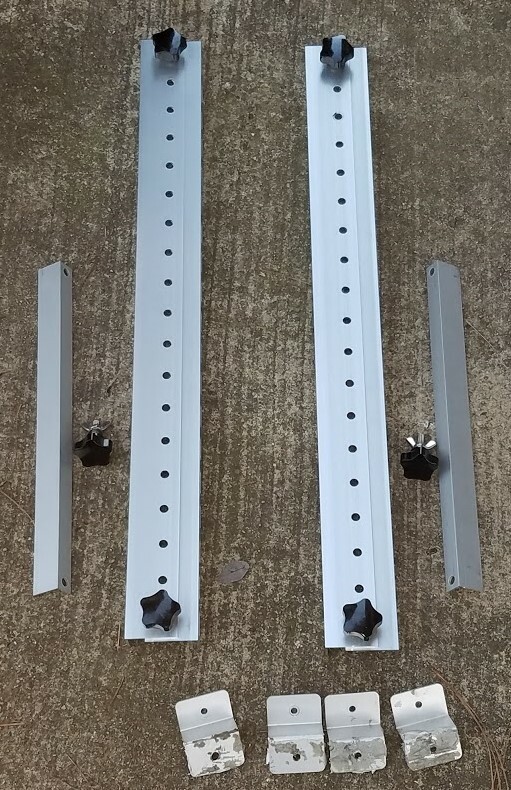 So it's all night and watertight, but totally removable except the flat aluminum, whuch was less than 1/3 he cost of the brackets, so they can be removed if the RV gets wrecked, and I don't lose them. And it's super secure. 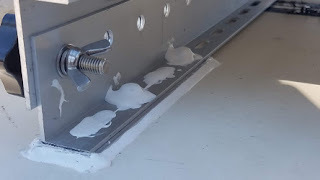 Oh, the roof is fiberglass with a very thin layer of aluminum on top, by the way. Here is the final result, from ground level. 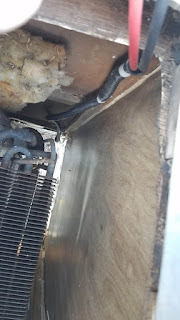 For the wires, I drilled two holes in the metal fridge roof vent, which is sloped downward with the mid way of the roof, and ran the wires down the vent shaft. I put in rubber grommets and they fit almost tight. A little silicone next time I have a tube open will seal it, though the way it's facing and with the overlap of the vent cover lid, I doubt water can get in very easily. 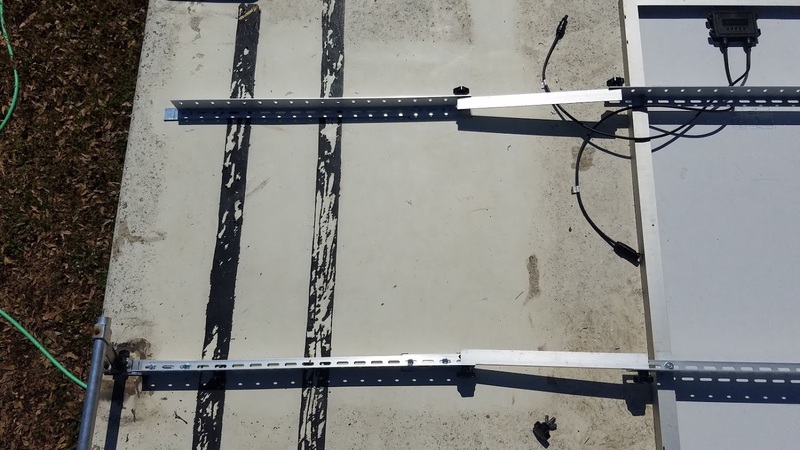 I put more cable clip things further down after I took the picture above. I still have to run the wires from the solar controller to the battery bank, but that's no big deal to do later. I have changed my living quarters again (twice). I got a (pretty rotten) motorhome a couple months ago. The diesel engine and newer fridge tempted me. I have been pouring too much money into it. Same ol' story. This is the best picture I have right now. I was rebuilding the door and had to replace the door's glass, hence why it's missing. That picture was a while ago, I just haven't taken a better one. Long story short about the trailer, I sold it and went back into the truck camper last summer. 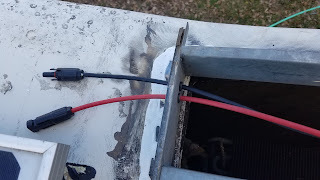 I kept and moved the solar panel, batteries, Fantastic vent fan to it. Now they have been moved to the motorhome. I also kept the LP tanks from the trailer, sold one and kept the other for a camp stove and instant hot water heater shower. I will probably soon sell the LP tank though, since the motorhome has a fixed tank. But maybe I'll just keep it in case I want/need it again. I stayed a few months in SD then came back south, a long round about way. The truck is getting stored for free at a relative's house, where the motorhome was parked in the picture above. I will soon be heading out on the road again, planning to spend the summer in New Mexico. I'm honestly truthfully gonna try to blog more. I still have the hotspot plan and I have a dinette in the motorhome, plus it has a big generator built in and I am going to also carry the small generator since it gets 5x the fuel economy. 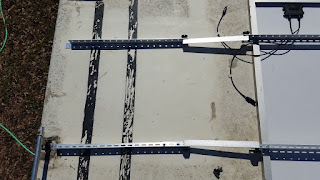 For the solar panel, I bought a tilt mount this time, so I can try to capture every ounce of sunlight . While in Missouri, I bought a bigger generator (1400W/2000W peak) and a 2 door mini fridge, rather than constantly buying ice. At the time, I only had one battery so it didn't do so well overnight. I also had to buy a bigger inverter for the fridge. I got one from eBay, since I had General Delivery mail access at the time. Well, I ended up returning the fridge. I bought a second battery instead, in case I got a cheap fridge again later on. Well, I did. A few days ago, I got an old Sears Coldspot fridge for free. Well, actually it cost about $12 in fuel to go get it, but yeah. It pulls more amps than modern fridges but it works nicely. A new $60-80 1.7 cu ft fridge would pull less power, so I might bite the bullet later on and get one. For now, I'm honestly trying to minimize costs at this very moment. Unfortunately, my generator, batteries and charging setup can't keep up, even with 100W solar panel tossing in a few amps here and there between the clouds. My 90s Yamaha EF600 generator is on my 500W/600W peak, so it can't start the fridge. It has a built in 10A charger, but the fridge just consumes that. I need a way to power the fridge separately from the battery bank while the batteries recharge, so I'm debating ordering that same generator again while it's still cheap. I might have to try to sell the Yamaha generator, even though I'd rather not. It's a great little generator. But, it's just too small for my power needs. I'd REALLY like to have the Harbor Freight 1600W/2000W peak inverter generator ($450+tax with coupon) but, I can't justify spending that kind of money right now. The cheap generator is about $160 with tax. Quite a difference in price. In the meantime, for free power, I bought a $19, 14 gauge, 100ft extension cord (10A max) so I can use an outdoor outlet at this park. I figured it was a good investment right now and for the future, anytime I see an outlet in a park that's far from the parking lot. The reason for the big push for a fridge? I spent probably $50 on ice just this month. It has been warm mostly, so 20lbs of ice at $4 to $5.50 lasts me all of 3-4 days. When it's 82 out, it gets up to 90+ in here, without shade. The fridge being off the battery bank has helped a lot in just a little over an hour, so yeah. I need that bigger generator I guess, as much as I hate to spend the money. I hated spending on ice just as much. Yeah it'll cost more in gas than the Yamaha and makes more noise. (The noise travels much further) I've considered a second solar panel, which costs only a small amount more, but on a cloudy day like today, I'd be in the same boat: not enough power. I'm debating just hanging around this city for all or most of next month. It seems vry doable based on what I have observed of other local RVs hanging around. That would actually allow me to buy the generator, rather than spending on fuel to drive 500+ miles. Plus I have access to that power outlet. Using it a few hours a day would probably be all I need. After 2 hours, my batteries are looking good. Yeah, I'm supposed to be in this for traveling, but at the same time, I can't disregard mundane, day to day existence. So we will see. So many free campgrounds are changing to pay, largely because of the continued gutting of taxes for the rich and corporations, causing federal, state and local governments to have to raise money somewhere to pay to maintain the parks. Cowell County Park near Charles City, IA has fallen victim to this. It used to be 2 weeks free according to Freecampsites.net. Now it's $10/night. Not free at all. Ouch!! I wonder how much money they are actually getting, since no one was there. When I got there, I didn't take the sharp right turn as I entered. Instead, I continued straight due to the trailer and a fence post that would have made the curve difficult. So, I missed the self pay box and $10/night sign. Instead, I went and got myself stuck on soft, grassy ground. After getting myself unstuck and inspecting the ground elsewhere, I moved. Then I walked Lucy, only then discovering the fact that it's now paid. FAIL!!!! So I packed up and left. I hurried across Iowa to get to this damn park, only to find it was no longer free. Yeah, I wasn't very happy. I no longer hurry to anywhere. I'll get there when I get there. After Lamar, MO's park no longer being 3 nights, only 1, Pittsburg MO's public use area changing to paid in 2019 from free, and now this? We can thank BOTH political parties for screwing 99% of the country for the past 38 years for this. Never trust that any free campground is still actually free. Certainly never hurry to one if it means using your fuel budget up, much like I did to get here. The rut from getting stuck. The pay station I missed when I got there, having entered on the road here in the background. I stayed around the Mason City, IA area a couple of nights. One day, somebody called the cops on me at a park in the middle of the day. Grown people act like frightened children anymore. 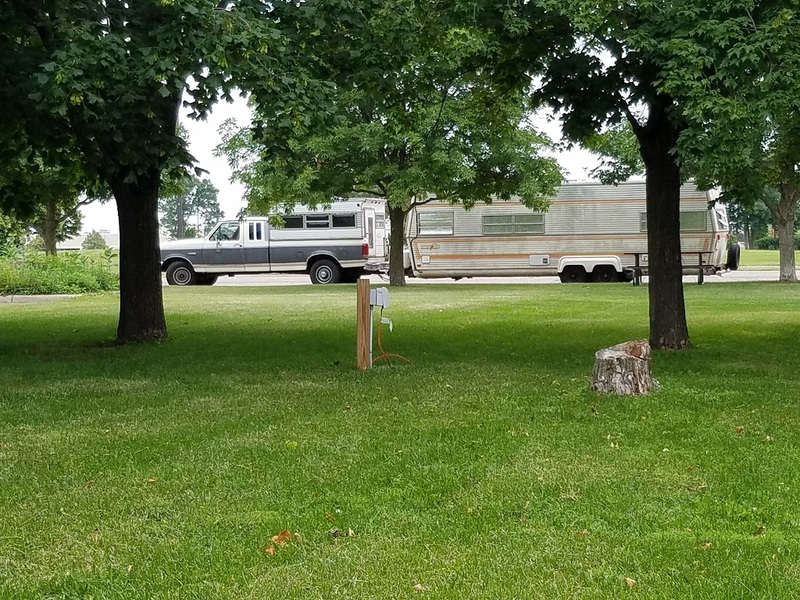 "OMG call the cops, somebody in an RV is at the park!!!!!! PANIC!!!!!!!!!!!!!!". He did his duty, checking out the bogus "suspicious person" call by running my license, then going on his way. I get that they have to investigate, so I don't blame the officer. He was polite and civil. It actually happened again in another (but smaller) Iowa town the next day or two after. I left the truck and trailer in a park, with an extension cord plugged in for a fan for Lucy, then walked to a nearby grocery store. As I was returning, a sheriff's dept SUV was cruising through the park, approaching me. Asked if that was my trailer, if I asked to use electric, blah-blah. 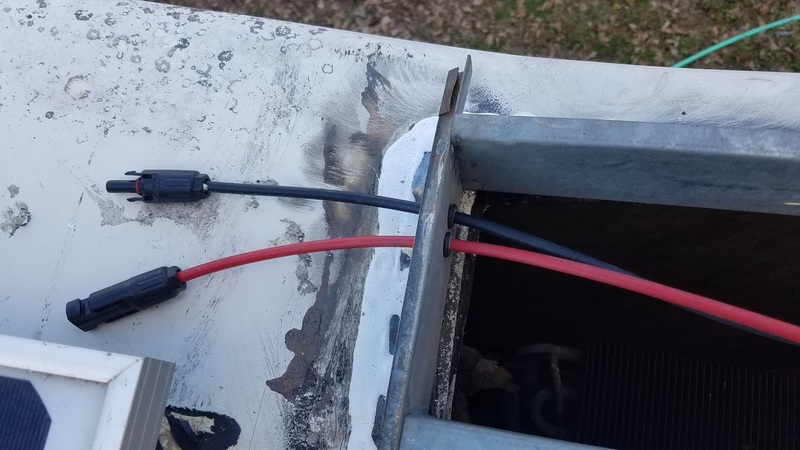 I said no I didn't ask but it was a warm day and I just have it for a box fan for my dog, I figured if anyone hated it that much, they could unplug it. He didn't fuss about it anymore though. The main thing I always get asked in most city parks is "you know you can't stay here overnight, right?". This time was no exception. ("No, I just fell of the turnip truck and didn't know that!"). So anyway, I had used the public pool there in the park (it had a nearly unmarked RV dump station, go figure!) for the $4 or whatever it was and got to briefly shower, enough to wash my hair at least. He ran my license then left, same as in Mason City. He did cruise around a bit longer while I was out walking Lucy, but I wasn't bothered anymore. But back to Mason City: I happened across a small car show! The 1950 Studebaker Starlight was the highlight car for me, the only one I bothered taking pictures of. Over on the east side of town, I spent a day at the park there that has this old steam train engine. The cotton trees (?) were molting like crazy, it looked like it was snowing, so much was falling and blowing in the wind. 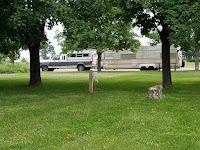 I stayed one night at the free city RV park in Lamar, MO. Freecampsites.net had it reported at 3 nights, which was now incorrect. It has a 24 hour limit. 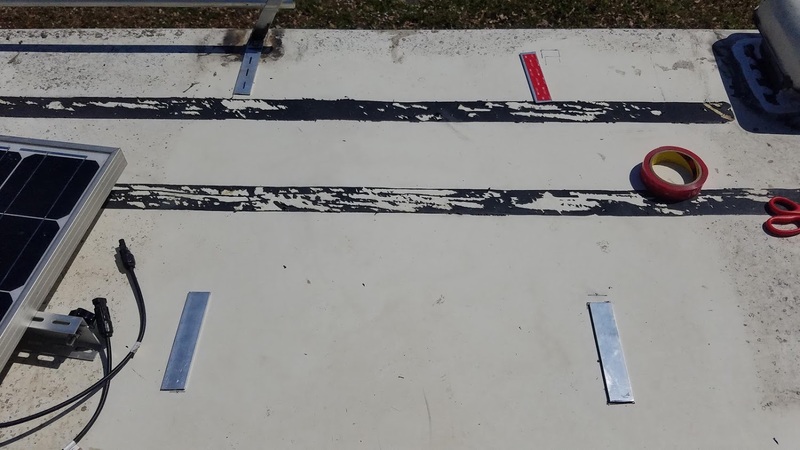 Park maintenance gets tiffed if they think you are staying longer. You are supposed to call in to report you are there, but I'm lazy and didn't. I stayed a night or two at the Walmart there to make up for it. It has electric, water (via far away spigots), and a dump station. It's right by busy train tracks and a crossing so it's noisy, though that doesn't bother me. While mostly hurrying across Iowa, one day I made a little pit stop in the small town of Northwood, IA to let Lucy stretch her legs and enjoy the nice little park they have.